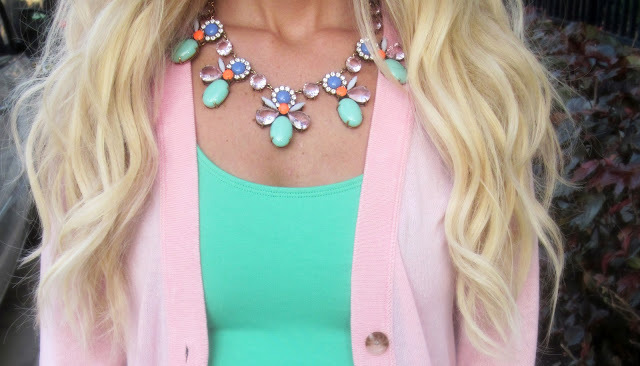 My favorite color combo for Spring has obviously been mint and pink. I put this outfit on without even realizing I was wearing this combo again. I have been looking for an inexpensive pink cardigan for a while. I was so excited to find this one at target. And yes I am wearing my fave shoes again!! I love playing with color so I thought the emerald green would add a fun twist to my pastel combo! LOVE the mint and pink! It's a favorite of mine, too! Definitely gotta check out that top & sweater. You are always looking so great!!! I love this outfit so simple and feminine but still looks amazing!! Gorgeous! I love this color combo as well. This is a perfect spring look. XO! I LOVE your cardigan!!!! I may just have to go snag myself one! i love the boyfriend cardigan over the jeans! super cute and casual then you bring in the accessories and it makes it super chic! love this look! I love the green shoes and that pretty J Crew statement necklace! I'm so glad you finally re-launched your blog! I've loved your Instagram for a long time. I love the cardigan! The Target link brings up the plus size cardigan. Is that the size you bought? Or do they make it in a regular sizes? I love that color combo as well!